What better way to brighten up your dinner with this Summer Salad. Easy entertaining! A wonderful fresh green salad with my sister’s recipe of homemade Asian dressing. Chop chilli,Place 2 tablespoons of fish sauce, 2 tablespoons of white vinegar, 1 tablespoon sesame oil,1 tablespoon peanut oil, 1 tablespoon sugar,2 teaspoons soya sauce, chopped parsley, place in pot over a low flame until sugar is dissolved and heated through. 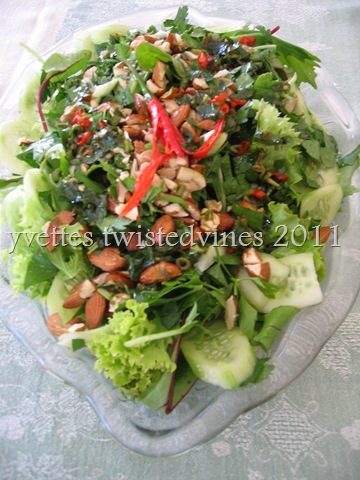 Prepare salad greens and cucumber on serving plate, sprinkled chopped almonds and chilli on top. Prepare sauce and pour over salad. A bitter sweet surprise to your salad. Join in the fun of sharing recipes, and link up to The King’s Court IV, here What’s cooking Wednesday. What a beautiful salad Yvette and I love the sound of your sister’s salad dressing. 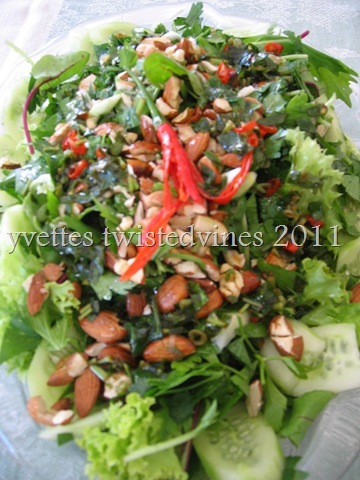 We are eating loads of salads at the moment with the explosion of heat and humidity that we are experiencing. Beautiful, Yvette, and perfect for this heat we’re having!